Happiest Tuesday to you! We’re so excited to be bringing you an amazing nine days of our Christmas/Holiday/Winter/Knock-Your-Socks-Off Release from Power Poppy! Today is Day 3 and I’m jumping in to show you the very lovely set, Rustic Rejoicing. A celebration of all things woodsy, as we rejoice and give thanks! Two unique focal images offer elegant imagery to set your holiday cards apart. A pretty bough with pinecones and jingle bells is set off by a loopy ribbon to which you may add the perfect accent color. Taking a pause from spreading peace throughout the land, a dove rests in a fir tree, olive branch poised. Add glowing detail to the holiday bulbs for pretty sparkle. Four sentiments help set the tone you're going for, whether peaceful or ebullient. This is the kind of stamp that gets me EVERY time! I love showcasing the elegant and yet rustic elements that winter and Christmas bring....classy, woodsy, cozy....that's where I was going with this design. With a backdrop of wood plank designer paper, I chose a warm colour palette for the pinecones and jingle bells, colouring it all up with Copics. An elegant die shows off the image, edged in Krylon Gold pen, with a matching curvy bit of green, also edged in gold. To give a nod to the rustic touches, I added a burlap fishtale banner, and some twine around jingle bells. The sentiment is a gold-edged diecut from TCP. Here’s the Copics I used for colouring, in case that’s helpful for you. 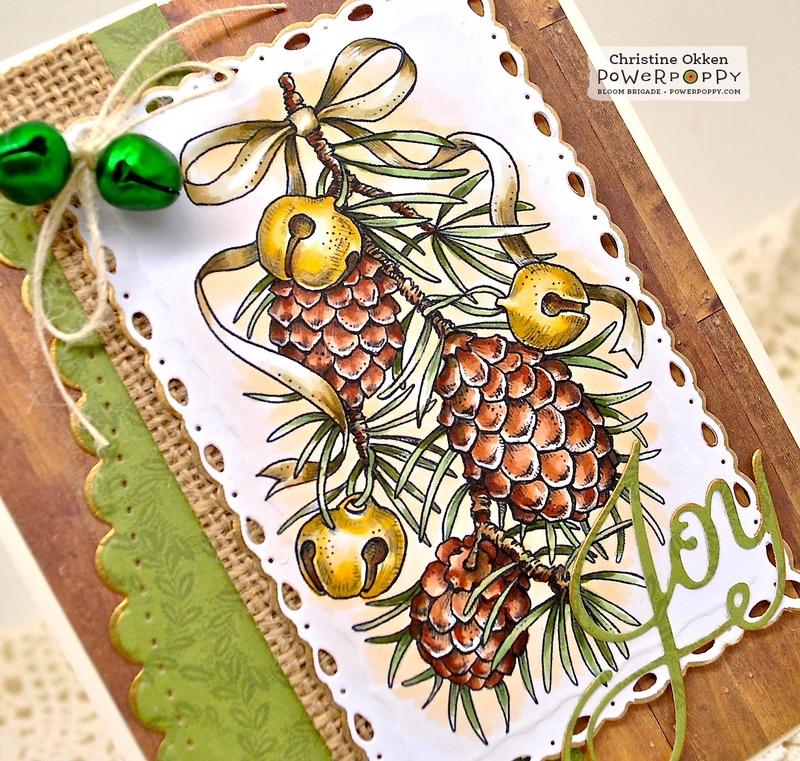 You nailed the rustic yet elegant look, your card is so pretty! Beautiful card and I love the extra bells. Wow that is beautiful, love the wood background and stunning coloring! Christine, this is gorgeous, and your coloring is fabulous! I love the rustic feel and love the wood plank DP. And who does not love our Krylon pens??? Beautifully done, and I love the added bells with the twine and the "joy" die. It's just the little things. Hugs! So, so pretty! 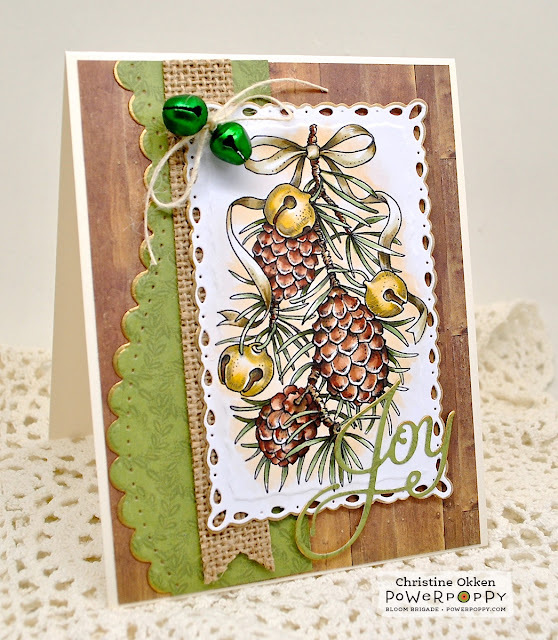 Love the earth tones and the way you used the border die to create a curvy piece behind your image! So beautiful! This is beautiful... so warm and cozy feeling. Truly amazing coloring! Beautiful. Your card is enough to sell this stamp set to me. LOVE it! I have all those Copics... now if only I could color it this beautifully. This is such a gorgeous card !